Calcium pyrophosphate deposition disease, also known as pseudogout, is a very common entity. 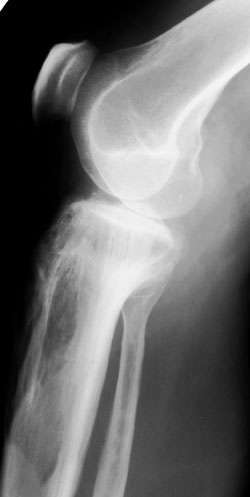 Radiographically, the presence of chrondocalcinosis is typical of this entity. Common locations for chrondocalcinosis include the knee, symphysis pubis, and triangular fibrocartilage at the wrist. Chrondrocalcinosis in the setting of CPPD is commonly associated with calcification of fibrocartilage. 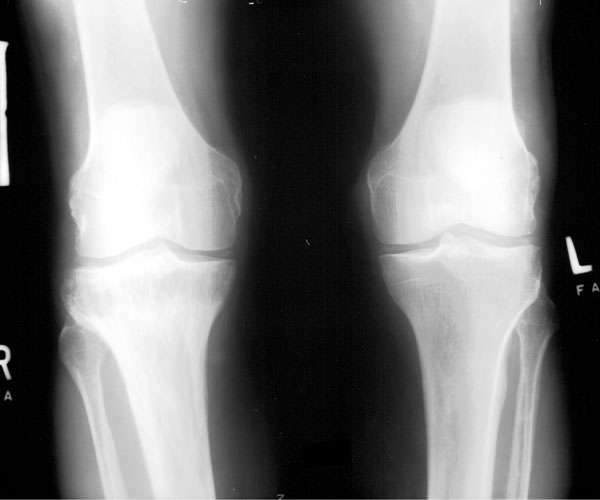 The AP radiograph of both knees shows chrondrocalcinosis of the menisci. 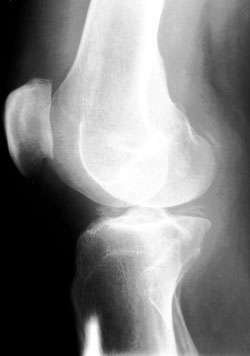 The lateral view of the left knee (Erin, this is flipped vertically) shows calcification within the menisci. The lateral view of the right knee (Erin, flipped horizontally) also shows calcification of the menisci. Incidentally, also noted in this patient is Paget’s disease of the right tibia, consisting of enlargement of the proximal tibia, thickening of the cortex as well as a lucent advancing front (arrow).